On first glance this is an image of a horse's head, but when you turn the image around you can see the head becomes an image of a frog sitting on a rock surrounded by water. Ohhh I finally see it. Turn your head to where the blue part is on the bottom. They both have the same mouth though.. That's pretty cool. 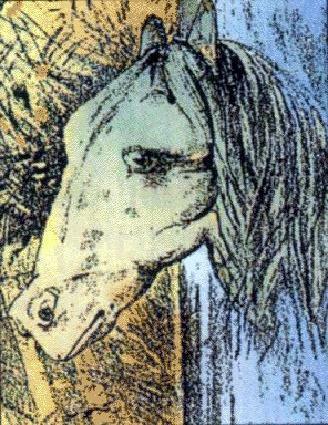 I recognized it, when vertical, I see a horse and when turning head to the left, I see a frog.